BoldGrid is the easiest way to build and manage WordPress websites AND it’s the most affordable. For a limited time, you can get all of our plugins and services, including fifteen Cloud WordPress installations, for just $60/year. Includes a Premium Connect Key to all BoldGrid plugins. Limited time offer. Never worry about weaving together a patchwork of questionable plugins, or purchasing a bunch of expensive plugins that still may not work together. We’ve got everything you need to build and secure your websites, for one, low affordable price. 200+ customizable website templates, organized by industry and interest, and a guided setup to help pre-populate important site elements. Our WYSIWYG, drag-and-drop page builder. Create rich column and row based layouts, add and edit sliders and widgets from within the editor, responsive design and more. Automated backup, fault protection, and migration solution. Remote backups via Amazon S3, automatic rollbacks after failed updates, easy site migration. Analyzes your page content in real-time and makes recommendations to help you maintain best SEO practices while writing content. Customize your WordPress gallery so that it exudes style and best represents your content. Includes plenty of options and display styles to help create a great eye-catching gallery. Cloud WordPress allows you to create fully functional free WordPress demos (with or without BoldGrid) in a few clicks. Design, build, test and share your WordPress website with clients or teams. Limited Time Offer! Get BoldGrid Premium for just $60/year! Price includes EVERYTHING BoldGrid has to offer! Unlock the full potential of BoldGrid by upgrading to BoldGrid Premium. 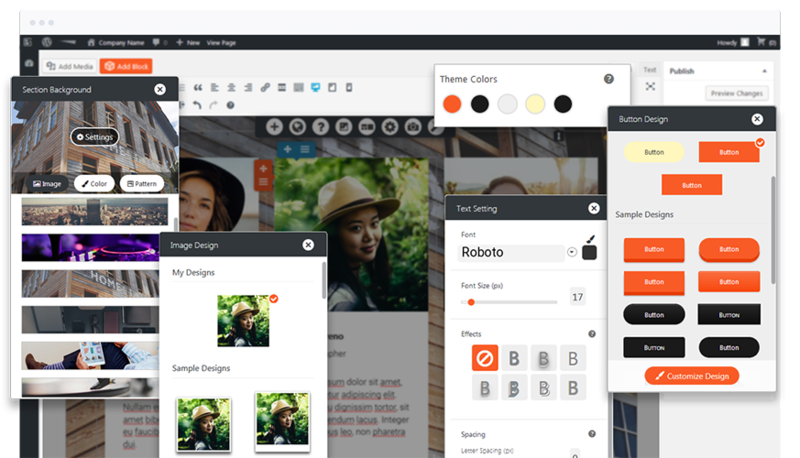 A true WYSIWYG editor, Builder allows you to create visually without shortcodes or coding. 200+ fully responsive WordPress theme options, separated by industry and interest. Easily find the perfect image with our integrated stock image search functionality. Build pages in half the time using beautiful, professionally designed content to build your website. Blocks can be edited via the visual editor or by modifying the HTML and/or CSS. Access additional Premium designs. Edit these blocks with the visual or text editors to perfectly fit your needs. Create and edit sliders from within Post and Page Builder. Sliders are rendered in real time, allowing you to see what it looks like before publishing a page. Add blog widgets to any page. Widgets can contain a single post, or a lists of posts. The widget renders live, so you can see exactly how it’ll look before publishing. Select a date and time for automatic backups and you’re good to go! Download, restore, or delete backups with a single click. Ensures the safety and integrity of your backups by archiving them remotely. Premium options include S3 and Google Drive. Free is restricted to FTP / SFTP. If any issues are found after updates, you can one-click restore your website or wait for the countdown to end and your site will automatically restore itself. Control which files, folders, and database tables are included in each backup. Simply install BoldGrid Backup on both WordPress sites, create a backup archive on the first site, then restore that backup on your second site. Need to restore only one file from a backup? The BoldGrid Backup Premium gives you the option to restore a single file within the backup browser. Keeps a running log of signification actions to your WordPress site, including which users updating a plugin, theme, or WordPress itself. An attribution link to BoldGrid will appear in the footer of your website. Premium allows you to hide all BoldGrid branding for a more professional or white-labeled appearance. You’re allowed to deploy up to 15 Cloud WordPress installations with BoldGrid Premium. Free users are restricted to one. Easily your site ranked in the search engines. SEO Page Checker analyzes your page content in realtime and makes recommendations to help you maintain best SEO practices. Create beautifully styled image galleries in seconds. Drag and drop your new gallery anywhere you want. Create WordPress forms in minutes. Create forms by simply selecting the fields you need and sliding them into the order you want in a snap. Cloud WordPress is the fastest way to test themes or plugins and prototype entire websites. Get up to fifteen WordPress installs in the cloud with just a few clicks. Manage your installations from a single interface. Use BoldGrid Backup to easily transfer your Cloud WordPress site to your live hosting account. Easily launch WordPress demos to test plugins without risk of breaking your live site, or build prototype websites. With BoldGrid Premium, you can launch up to 15 one click WordPress installations. Free keys are limited to one installation. Verify your email and have access to your installs for as long as you need. Unverified email installs last 48 hours. Be Inspired. Be Empowered. Be Bold. WordPress is already used by more than 60 million websites on the internet. Be bold and stand above the rest with BoldGrid.